It’s an insect! It’s a spider! It’s a scorpion! It’s… a camel spider? With an intimidating appearance resembling a cross between a spider, a giant termite and also a scorpion, knowledge about the camel spider’s characteristics and behaviour have been dogged by folklore tales and myths that paint the creature to be a menacing terror. The camel spider is falsely believed to be able to grow to as large as a dinner plate. Also thought to be venomous, camel spiders are supposedly able to numb their victims with anesthesia and feed on large mammals such as camels. Also, these creatures are said to be able to travel at speeds of 30 miles per hour and produce a terrifying scream when they run. There are also many tales documenting how camel spiders have haunted desert soldiers and are a horror to encounter. However, many of these stories stem from misunderstandings of these creatures, resulting in misconstrued perceptions. Neither an insect, a spider nor a scorpion, the camel spider (Galeodes toelgi) belongs to a unique order of its own. They are called Solifugae and they fall under the class of Arachnids. 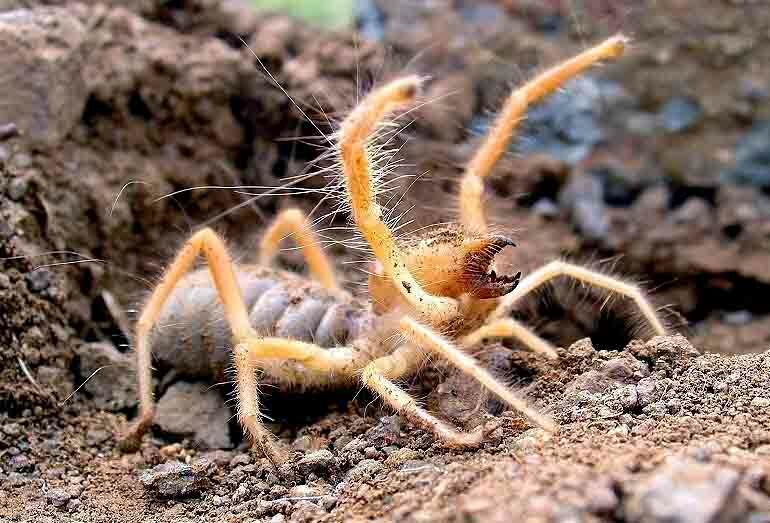 Solifugae is a Latin term meaning those that flee from the sun, and this is highly characteristic of the camel spider. These creatures are largely nocturnal animals, preferring to hunt in the night. In the day camel spiders often scuttle for shelter and escape the heat by retreating under burrows and logs which they excavate themselves. Camel spiders can be found in the hot desert regions of the world (which is how they derive their name), such as in the desert regions of Southwest Asia and also the Middle East. Camel spiders are aggressive creatures, but harmless to humans unless provoked or handled. They can grow up to 6-8 inches (approximately 15-20cm) and are distinguishable by their hairy legs and large pliers-like jaws. Despite its resemblance to a spider, camel spiders lack two distinct spider characteristics. They do not have silk nor venom glands. Camel spiders rely on their speed and powerful jaws to hunt. 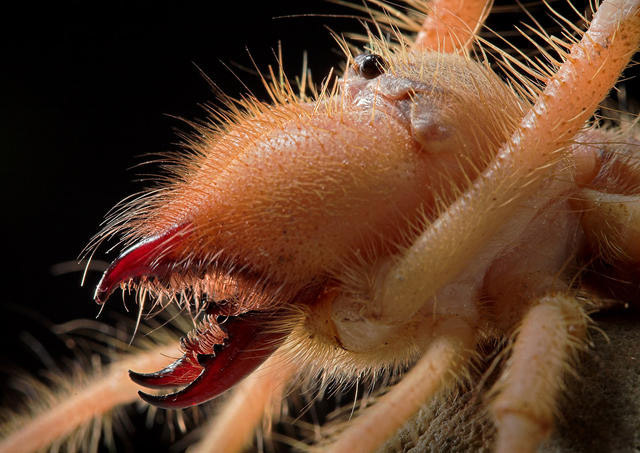 With their noticeable jaws, camel spiders are highly capable of delivering a painful bite. Larger species with big jaws can easily puncture and tear skin which may cause infection if left untreated. Camel spiders also have a voracious appetite (in part due to their high metabolism rate) but do not prey on mammals and instead feed on insects, scorpions, spiders and centipedes. They are capable of running up to 10 miles per hour, a remarkable feat considering its size. The loudest sounds they produce are the gnawing noise they make when they feed in a sawing motion with their paired jaws, and not a scream they are thought to produce when they run. Desert biologist Fred Punzo was one of the earliest biologists to study Solifugae and documented the aggressive behaviour of camel spiders in his book The Biology of Camel Spiders (1998). In it, he also mentions additional folklores that misrepresent the true nature of camel spiders and seek to correct these misperceptions through a detailed biological study of these creatures. “Camel Spider” by Badspiderbites.com (2007). URL: http://www.badspiderbites.com/camel-spider/ (Date accessed: 06/04/2010). “Camel Spiders” by Buzzle.com Intelligent Life on the Web. (2000). URL: http://www.buzzle.com/articles/camel-spiders.html (Date accessed: 06/04/2010). “Camel spider” by camelspider.org (undated). URL: http://www.camelspider.org/ (Date accessed: 06/04/2010). URL: http://www.camelspiders.net/ (Date accessed: 05/04/2010). Punzo, Fred. (1998). The Biology of Camel-Spiders (Arachnida, Solifugae), Norwell: Kluwer Academic Publishers. MA. “Solifugids” by US Army Center for Health Promotion and Preventive Medicine. (2005). “Attacking Camel Spider” by Bayram Gocmen: TrekNature, 4 April 2008. “Camel Spider” by YouTube Channel, 4 September 2006. When it comes to fishing for the Silver Carp, it is actually possible to just sit back, relax, and watch as the fishes leap right into your boat and even onto your lap! In fact, the Silver Carp might even come right at your face, injuring you in the process. The Silver Carp, Hypophthalmichthys molitrix, can grow up to 18 kilograms (kg) and leap as high as 3 metres in the air (“Silver Carp” Wikipedia). The sound and vibration of motorboats tend to send the Silver Carps into frenzy as they often mistake the disturbances as caused by predators (“Silver Carp in Action.avi” Youtube Channel). The Silver Carps are therefore scared into leaping out of the water and studies have shown that this response “is more pronounced with higher RPMs and greater motor noise” (Kolar et al., 2005). People therefore often mistook the Silver Carps for flying fishes. With Silver Carps that can weigh up to 18 kg and boat speeds that can reach more than 32 kilometres per hour (Kolar et al., 2005), the impact with the incoming leaping fish can be very great and even disastrous. According to Meersman (2004), a boater Marcy Poplett was struck in the face by a Silver Carp on the Illinois River on October 2003. She was knocked off her watercraft and fell into the river unconscious. Fortunately, she was rescued but with a broken nose, concussion and injured back among other injuries (Kolar et al., 2005). On another occasion, an impactful encounter with a Silver Carp broke the jaw of an American teenager, Seth Russell, leaving him in need of oral surgery to wire some teeth back together. These are the two more notable cases among a host of other injuries that resulted from “the attack by the invasive species (the Silver Carp in this case)” (Heok, 2008). The Silver Carp is an Asian carp that was first introduced to North America from China “to control algae growth in aquaculture and municipal wastewater treatment facilities” (“Silver Carp” Wikipedia). They however, managed to escape from captivity and due to their high proliferation quantity and rate, by 2003, they had spread into the Mississippi, Illinois, Ohio, Missouri rivers and others (“Silver Carp” Wikipedia). As filter feeders, their huge number is a major threat to native filter feeders (Aitkin et al., 2008). This direct competition has resulted in a great reduction in the amount of native species in the rivers and this has affected the biodiversity of the region. There is definitely a pressing need to reduce the massive number of Silver Carps in the rivers. The high population density of the Silver Carp renders their massive, incessant acrobatic leaps out of the water, and into the air, a breathtaking sight to behold. This “superswarm” is a man-made swarm that could be attributed to the negligence of man for not ensuring that the Silver Carps that were imported were sterile and effectively held captive. It is therefore unjustified to label the Silver Carps as an “invasive species” or to state that they “cause[d] serious damage” and are guilty of “seriously injuring boaters” (Kolar et al., 2005). All these appear to point to the negative, harmful aspect of nature by putting the blame on nature. The accidents and adverse effects are a consequence of Man’s interference with nature. It shows how Man has upset the balance of nature and has ironically caused harm to themselves instead. The Silver Carp man-made “superswarm” parallels that of the African Bees which were also imported from one native place (Africa) to another (Brazil) as a result of Man’s another attempt to temper with nature to make “better honey producers” (Stanford & Hall, 2009). Refer to article “The Brazilian Honeybee,” by Charles D. Michener. “African Honey Bee: What You Need to Know,” by Malcolm T. Sanford and H. Glenn Hall. University of Florida IFAS Extension, (September 2005). URL: http://edis.ifas.ufl.edu/pdffiles/MG/MG11300.pdf (accessed on 2 April 2010). “Asian Carps of the Genus Hypophthalmichthys (Pisces, Cyprinidae) ― A Biological Synopsis and Environmental Risk Assessment,” by Cindy S.Kolar et al. U.S. Fish and Wildlife Service, (12 April 2005). URL: http://www.fws.gov/contaminants/OtherDocuments/ACBSRAFinalReport2005.pdf (acessed on 2 April 2010). “Columbia River Basin Asian Carps Risk Evaluation,” by J. Kevin Aitkin et al. U. S. Fish and Wildlife Service, (22 February 2008). URL: http://www.asiancarp.org/Documents/AsianCarp_PNWRiskEvaluation_022208.pdf (accessed on 2 April 2010). “Hypophthalmichthys molitrix Silver Carp 2000,” by Uland Thomas. Flickr, 1 May 2009. URL: http://www.flickr.com/photos/10362071@N03/3493258530/ (accessed on 1 April 2010). “Leaping Silver carp breaks teenager’s jaw,” by Heok Hee Ng. Practical Fishkeeping, (9 September 2008). URL: http://www.practicalfishkeeping.co.uk/content.php?sid=1752 (accessed on 2 April 2010). “Silver Carp in Action.avi,” by Youtube Channel, 25 February 2010. URL: http://www.youtube.com/watch?v=WD9DeAiUhCA (accessed on 1 April 2010). “Silver Carp”. Wikipedia, (22 March 2010). URL: http://en.”Silver Carp” Wikipediapedia.org/”Silver Carp” Wikipedia/Silver_carp (accessed on 2 April 2010). “The Brazilian Honeybee,” by Charles D. Michener. BioScience, (September 1973). URL: http://www.jstor.org.libproxy1.nus.edu.sg/stable/1296479?seq=1&Search=yes&term=bees&term=african&term=facts&list=hide&searchUri=%2Faction%2FdoBasicSearch%3FQuery%3Dafrican%2Bbees%2Bfacts%26gw%3Djtx%26prq%3Dafrican%2Bbees%2Bimport%2Bto%2Bbrazil%26hp%3D25%26wc%3Don&item=7&ttl=1224&returnArticleService=showArticle&resultsServiceName=doBasicResultsFromArticle (accessed on 3 April 2010). Hummingbirds, Trochilidae, are among the world’s smallest birds, and can only be found in the Americas. Known for their diminutive size and ability to fly backwards, Hummingbirds are capable of flight speeds exceeding 15m/s. Two interesting facts to note about the Hummingbird, is its ability to hover mid-air, through the rapid flapping of its wings as well as its extraordinarily high metabolic rate. Hummingbirds get their name from the “hum” heard as a result of the rapid flapping of their wings, which allows them to hover mid-air. Hummingbirds are the only species capable of hovering for a long period of time, and hover for a large part of their lives and have special mechanisms which allow them to flap their wings up to 80 times per second. This is enhanced by their extraordinarily high metabolic rate, which causes the expansion of their heart, and thus supplying their wings with the oxygen needed to flap rapidly and stay stationary in mid-air. Hummingbirds make use of their ability to hover for prolonged periods of time to forage for nectar. 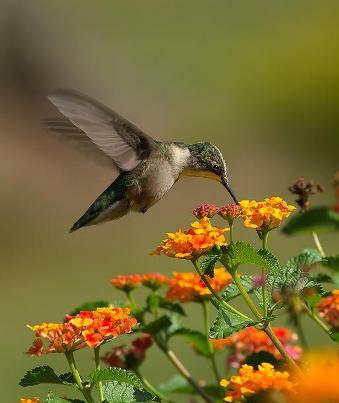 It has been studied that the formation of flowers and hummingbirds feeding habits are the key reasons why it is more energy efficient for them to hover instead of perch like larger bird species. An article by Richard S. Miller – How Hummingbirds Hover, concurs on this point and investigates Hummingbirds foraging behavior and how hovering plays an important role. He also concedes that “floral architecture rather than energetics” may be the reason for hovering in Hummingbirds. Richard S. Miller, October 1985. How Hummingbirds Hover, The Auk Vol. 102, No.4,pp. 722-726.